It is already at the end of a down tide. The current flow has just slow down. Bait was very lasting tonight as this is my second change bait since early evening. I was just busy looking for squid around my lamp. Suddenly my reel alarm goes off. I was block by my squid net so Seng who was just standing beside my rod got hold of it and strike first. I took over the rod and the fish was just struggling around. I was wondering which hook it took as I had a cable car rig on the top with a live bait and the bottom rig with a dead night herring. The fish make several acrobatic jump on the way while I reel it in. Upon reaching below the jetty and under the light of my sqiud lamp, I saw it was deeply hook in the mouth by the bottom feeder. I ask Seng to used hand to pull it up by gripping on my leader. 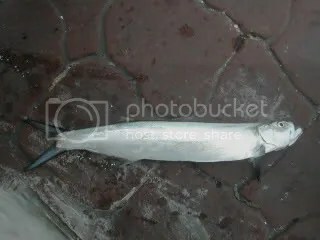 It was a Giant Herring or Teck Ngoh about near to 2kg. After I removed the hook, the fish was already dead and I gave it to Chuan who was there in the early afternoon and will be heading home soon. Caught this small Wolf Herring sometime back last month on a cable car rig with live tamban as bait. 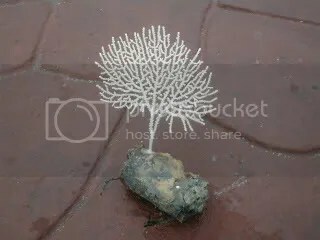 Saw a angler hook up this coral plant grow on a discard battery from the bottom of the jetty last week. It was release back to where it was after this photo taken.